There are more than 220,000 vehicle crashes on Florida’s roads each year, according to figures released by the Florida Department of Highway Safety and Motor Vehicles. This equates to a staggering 600+ crashes each day. 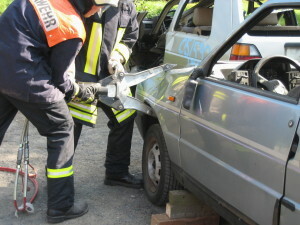 The majority of these accidents cause some form of injury, while more than 2,000 are classified as fatal car accidents. Safety on Florida’s roads is a significant concern for authorities, and the high accident rate means that all drivers and pedestrians are at risk of serious injury. If you are the victim of a car accident and you sustained serious injuries, you may have a right to compensation. You do not have to struggle through the pain and medical bills alone. Wolfson Law Firm, LLP is an established and respected Miami personal-injury law firm, and we can help you claim compensation for car accident injuries. Call us today at 305-285-1115 for a free case evaluation with a car accident lawyer. CBS Miami reports that a Good Samaritan rescued a man from an SUV that crashed into a pond. The man claims that he did not have a choice and acted instinctively to assist. The crash involved an SUV and a white car on North East 6th Avenue. The man in the white vehicle sustained serious injuries, and emergency workers rushed him to a nearby hospital. The driver of the SUV also sustained injuries and went to a nearby hospital. The exact cause of the accident is unclear at this stage. The Good Samaritan, Alex Lemaire, says he saw the car flipping in the water. He ran to the vehicle, where he saw the victim. He walked into the water, grabbed the victim and walked away from the wreckage concerned that it may catch fire. Lemaire is from Haiti and has lived in the United States for nearly 40 years. He says the man he rescued seemed to be in reasonable condition but was suffering head and back pain. WSVN reports that a car crashed into a check-cashing store. The car initially crashed into another vehicle and then spun off, colliding into the nearby store on 4th Avenue. Eyewitnesses claim the accident resulted in a loud noise and startled bystanders. The accident caused damage to the front end of the store. One driver sustained injuries in the collision, and emergency workers transported him to the hospital. The other driver did not suffer injuries and received treatment on the scene. Police are investigating the cause of the accident in order to ascertain how the two vehicles collided. A car accident can leave lasting injuries and expensive medical bills. If you are injured in a crash, an experienced Miami personal-injury lawyer may be able to help recover some of the costs. At Wolfson Law Firm, LLP, we are committed to defending the rights of the injured. For a free case evaluation, call us today at 305-285-1115.